Pink is a very popular colour in our small bags, so I decided to add a new colour – candy pink. This small bag is a bright, pretty colour in plain candy pink, with a multi print pocket almost the length of the bag so that it takes a 5 inch small teddy with room to spare. And just to demonstrate, here are the pictures of small teddy inside and outside the bag. Small bags can be used as shoulder bags for a child or as handbags. They are for sale, including the small teddy, at £5.00 each. Posted on September 30, 2017 September 28, 2017 by Silvi VealePosted in Handbags, Little Bags, Shoulder Bags, Teddy in a bagTagged all ages, Children's bags, Crochet Bags, Shoulder Bags, small teddy, Teddy Bags. Here is another of our satchel bags. This one is in lilac multi-colours which are very pretty and eye-catching. The satchel-style handbag is fully lined, with space for a number of items. It has toggle fastening tightly attached for safety. The satchel bag with tiny teddy is a medium-sized bag and ideal for children over 3 years and for anyone else who wants an eye-catching bag with a tiny teddy! Satchel bags retail at £7.00 each. Posted on September 29, 2017 September 28, 2017 by Silvi VealePosted in Handbags, Teddy in a bagTagged Children's bags, Crochet Bags, Older Children's Bags, satchel bag, Teddy Bags, tiny teddy. Here is another of our children’s backpacks. This one is in lilac with a cream trim. Toggle for closure is sewn on very tightly for safety and the backpack is fully lined. And of course it comes with a small teddy in the front pocket. Pictures show the 5 inch teddy inside and outside the pocket, so that you can see the size of the backpack, which is ideal for a child. Backpacks are for sale at £8.00 each. Posted on September 28, 2017 November 6, 2018 by Silvi VealePosted in Backpacks, Teddy in a bagTagged backpack, Children's bags, Crochet Bags, small teddy. Here is another of our classic tote/handbags. This one is in a lovely shade of dark pink (which is almost red but not quite). This is a medium sized bag which will make a lovely gift for a child over three, a teenager, or an adult who wants something cute for days or evenings. The tote is fully lined and sturdy to take a variety of contents. Our tote/handbags come in a range of colours and can be purchased for £8.00 each. Posted on September 23, 2017 September 21, 2017 by Silvi VealePosted in Handbags, Teddy in a bag, Tote BagsTagged Children's bags, Crochet Bags, medium bags, Older Children's Bags, Teddy Bags, tiny teddy. This is another of our small cream and pink bags. This one has a flower detail pocket where the tiny teddy can sleep. These little bags come in a range of pretty colours and all have a tiny teddy in the pocket. Tiny teddies are about 3 inches in height and have moveable limbs. They carry the CE mark for safety, but I would not recommend giving a tiny teddy to a child under three to play with, as they are tiny. But for over threes, these little bags with a tiny teddy sleeping in the pocket make a very sweet gift to love and cherish. 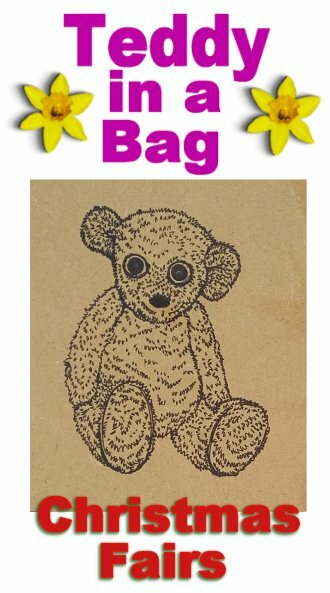 Our little bags with tiny teddy are £5.00 to purchase. Posted on September 22, 2017 September 21, 2017 by Silvi VealePosted in Little Bags, Teddy in a bagTagged Children's bags, Crochet Bags, small bags, Teddy Bags, tiny teddy. This is another of our small bags which have a small teddy in the larger front pocket. This one is in dark pink sparkle with cream edging (sorry that the sparkle thread doesn’t show up in the pictures – it is quite subtle however). The bag’s strap is long enough for a child to use the bag as a shoulder bag if they prefer, but for safety it is not too long. Small teddies are 5 inches in height. Both types of teddy have the CE mark. They also have moveable limbs. And here is the small teddy in the front pocket of the bag. There is room in the pocket for the teddy to nestle right down in, rather than peek out if you prefer. The dark pink sparkle bag with small teddy is £5.00 to purchase. Posted on September 21, 2017 by Silvi VealePosted in Little Bags, Shoulder Bags, Teddy in a bagTagged Children's bags, Crochet Bags, Shoulder Bags, small teddy, Teddy Bags.